All visits are by appointment. Puppy appointments will be made no sooner than 8-12 weeks from birthdate, or after vaccines. Serious inquirers are invited to complete the Nysa Hill Dog Application. We're Members in good standing of The American Whippet Club, The Vizsla Club of America, The Delta Society, The Greater San Diego Whippet Association, APDT and PSI. We would like to help you find a wonderful conformation dog, obedience or agility partner, therapy dog or family pet, however you will need to do your research, be prepared to be screened and visited. The time is well-spent, as you want to find just the right match for you and your family. If we do not have new pups or a suitable dog available, we only refer inquiries to AKC breeders who meet certain standards. 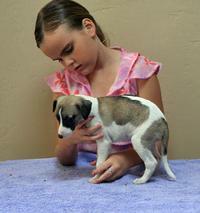 Our dogs and puppies come with MULTI-GENERATION AKC PEDIGREES, health certifications and our Nysa Hill Puppy Pack. Wherever you select your dog, make sure you know its health history for several generations. Ethical breeders know their dogs and the history of their predecessors, and have hand-raised and/or lived with their dogs for years. They will also do their best to remain available to help you with questions for the life of your dog. At the end of this page are some additional links which may be helpful in your search for a healthy companion and just the right dog for your home. Good luck! The more we know about you and your lifestyle, likes and dislikes, the better match we can make. 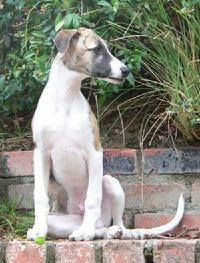 For example, whippets like exercise but also enjoy endless hours sleeping and cuddling. Vizslas are busier, as sporting dogs they need ample room to romp and play most of the day. One animal may prefer to be with other dogs, while another may enjoy being your sole pet and companion. This is the DOG & PUPPY INQUIRY. If you are interested in Nysa Hill services, please see the Services and Rates page. If interested in a show dog, how many years have you previously been involved in show dogs? 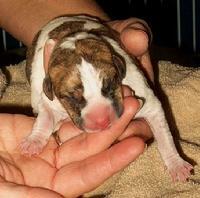 Are you interested in puppies from a particular Nysa Hill dog or litter? If so, which? Are you interested in a female or male? Why? If yes, how many, what breed(s)? Have you owned other pets in the past? if yes, what happened to them? What breed characteristics primarily attracted you to it? How did you become interested in this breed? Have you researched the breed? Tell us how, with whom, etc. Where will your Nysa Hill pet live? Indoors? Outdoors? What do you plan to do with your dog on weekends? Walk? Hike? Run? Play ball? Share a great game or movie on the couch? What age of dog are you looking for and why? Do you have a fenced yard? If yes, what size, type and height? How secure is it? Do you work in a dog-friendly office or environment in which your dog may go to work with you? Do you work in an animal-related field? When left alone, will the dog be in its own den or kennel? In a secure room? With other dogs in a kennel or room? Or loose? Please list your household members' names and ages. If they do not have your last name, please include theirs. Would you like us to share your information with other colleagues/breeders who may have what you're looking for?